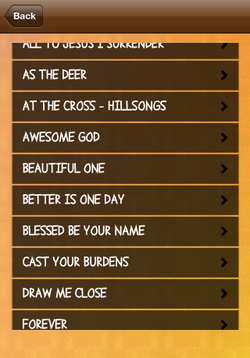 Worship Song Book Lite iPhone app lets you carry choosen lyrics of worship songs generally sung in churches on your iPhone. - Now you can watch the related youtube videos for the songs. - Currently this app has more than limited songs but please check our full app which contains lot more songs in 3 different languages. i.e English,Hindi,Malayalam. - Please check our full version for the app.